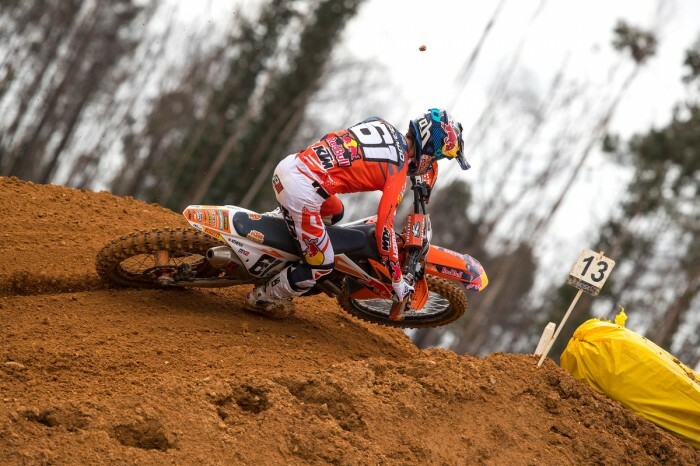 Spanish flyweight Jorge Prado (Red Bull KTM) handed his MX2 team-mate Pauls Jonass a comprehensive beating at round five of the FIM Motocross World Championship at Agueda in Portugal. After three rounds the 17-year-old trailed the reigning champion, who won the first six motos of the campaign, by 45 points but his second overall win in the space of seven days – this time coming from one-one finishes – has slashed the gap to just 14 following another below-par performance from the Latvian who carded two-seven to end the day fifth overall. Ben Watson (Kemea Yamaha) missed a first-ever overall podium by a bike’s length when he backed up his fifth in the opening moto with a career-best third second time out. The Brit – fourth in the points table – hunted down tall Dane Thomas Kjer Olsen (Rockstar Energy Husqvarna) in the closing laps of race two but came up short by 0.172. Olsen, who finished fourth in race one, took second overall ahead of young Aussie Jed Beaton (F&H Kawasaki) whose three-four finishes earned him the third step on the podium ahead of Watson by two points. Prado holeshot both 30-minute plus two lap races and was never headed. On the technical track which quickly became heavily rutted he hardly put a wheel wrong, winning the first race by almost five seconds and moto two by three seconds after visibly backing it down in the final stages of both. American contender Thomas Covington (Rockstar Energy Husqvarna), who won last weekend’s second moto in Italy, was forced to pull out of second in race one after six laps when he twisted his knee in a rut, sustaining a suspected ACL injury. It was a good weekend for Britain’s Adam Sterry (F&H Kawasaki) who started the opening moto in sixth and ran as high as fifth before losing a place to Watson in the closing laps. In race two he got another solid start and brought it home in ninth for seventh overall, one place behind Watson’s Russian team-mate Vsevolod Brylyakov. Conrad Mewse (Hitachi ASA KTM UK) struggled all weekend. All the way back in 21st after yesterday’s qualification race, the 18-year-old crashed in race one and damaged his bike and in race two he never really got going, ending the moto out of the points in 21st. As a result he slips from fifth in the championship down to seventh.